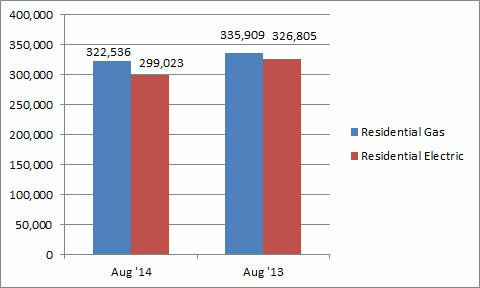 U.S. shipments of residential gas storage water heaters for August 2014 decreased 4.0 percent, to 322,536 units, down from 335,909 units shipped in August 2013. Residential electric storage water heater shipments decreased 8.5 percent in August 2014, to 299,023 units, down from 326,805 units shipped in August 2013. For the year-to-date, U.S. shipments of residential gas storage water heaters increased 2.7 percent, to 2,913,876, compared to 2,835,986 units shipped during the same period in 2013. 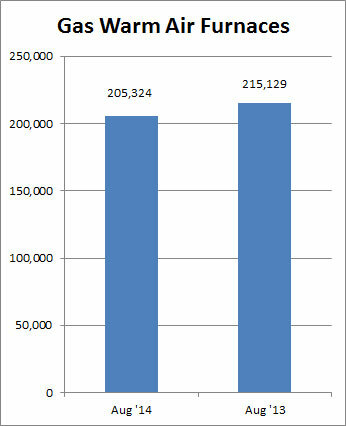 Residential electric storage water heater shipments increased 4.1 percent year-to-date, to 2,773,935 units, compared to 2,665,728 units shipped during the same period in 2013. Commercial gas storage water heater shipments decreased 0.4 percent in August 2014, to 6,805 units, down from 6,834 units shipped in August 2013. Commercial electric storage water heater shipments decreased 11.9 percent in August 2014, to 5,517 units, down from 6,261 units shipped in August 2013. Year-to-date U.S. shipments of commercial gas storage water heaters increased 4.4 percent, to 63,646 units, compared with 60,960 units shipped during the same period in 2013. Year-to-date commercial electric storage water heater shipments increased 7.6 percent to 49,418 units, up from 45,948 units shipped during the same period in 2013. U.S. shipments of gas warm air furnaces for August 2014 decreased 4.6 percent, to 205,324 units, down from 215,129 units shipped in August 2013. 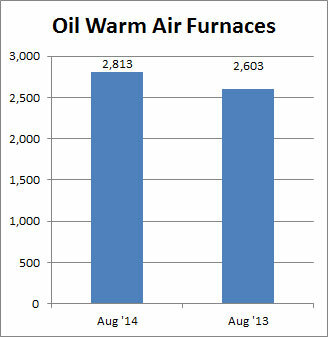 Oil warm air furnace shipments increased 8.1 percent, to 2,813 units in August 2014, up from 2,603 units shipped in August 2013. Year-to-date U.S. shipments of gas warm air furnaces increased 3.1 percent, to 1,631,750 units, compared with 1,583,426 units shipped during the same period in 2013. Year-to-date U.S. shipments of oil warm air furnaces increased 6.7 percent to 17,050, compared with 15,983 units shipped during the same period in 2013. U.S. shipments of central air conditioners and air-source heat pumps totaled 518,650 units in August 2014, up 3.6 percent from 500,813 units shipped in August 2013. 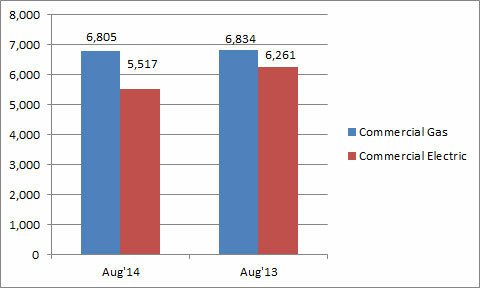 U.S. shipments of air conditioners increased 0.3 percent, to 348,703 units, up from 347,718 units shipped in August 2013. U.S. shipments of air-source heat pumps increased 11.0 percent, to 169,947 units, up from 153,095 units shipped in August 2013. 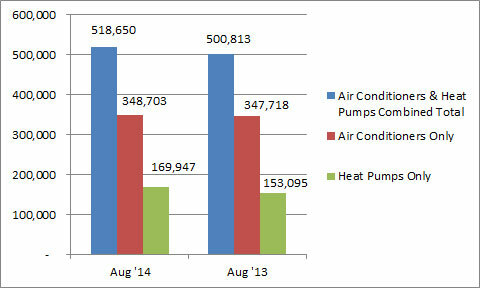 Year-to-date combined shipments of central air conditioners and air-source heat pumps increased 6.3 percent, to 5,060,065 units, up from 4,760,730 units shipped in August 2013. Year-to-date shipments of central air conditioners increased 2.6 percent, to 3,365,101 units, up from 3,280,528 units shipped during the same period in 2013. The year-to-date total for heat pump shipments increased 14.5 percent, to 1,694,964 units, up from 1,480,202 units shipped during the same period in 2013.